Start with a wedding planner checklist, as well as how to craft the perfect wedding registry. To continue to help brides learn about the best four things to do right after your your engagement to kick start the planning! CHICAGO, IL, December 05, 2017 /24-7PressRelease/ — Chicago Bride magazine, a premier wedding resource for Chicagoland brides, is excited to announce the release of its latest issue, both in print and digital issues. This issue dives into all the different aspects of the wedding process starting with a wedding planner checklist, as well as how to craft the perfect wedding registry. To continue to help brides learn about the best four things to do right after your engagement to kick start the planning! This issue also includes tips and tricks on how to beautify your look before the big day with tips by NYC hair stylist, tips for picking jewelry to compliment the dress, and all about a local wedding boutique that has gowns to fit the unique style and shape of each bride. “Here at Chicago Bride, not only do we try to make the wedding planning process go as smoothly as possible, but we hope to inspire brides to plan the wedding they always dreamed of having,” says Kari Polydoris, Editor of Chicago Bride. 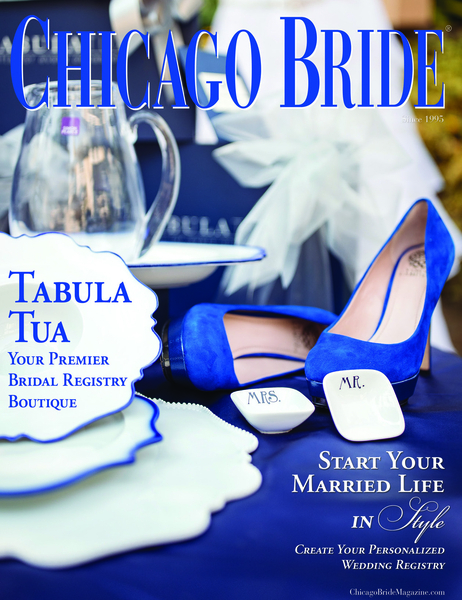 This issue’s featured Cover Story is all about creating a personalized wedding registry specific to your unique style with Lincoln Park’s Tabula Tua. In the midst of the wedding excitement, it is common for couples to create a mundane wedding registry, but Tabula Tua helps couples to get creative and let guests know what you’d really love to have. On top of the tons of beauty tips and tricks, this issue dives into an important topic that cannot be ignored: money. Learn about a new way to spend money on your wedding day with a new wedding gift card, and what special wedding expenses are worth the splurge. You will also discover how to scale back on certain wedding costs, tips and tricks on budgeting from a personal expert, and a new cool way to go over finances with your partner. Of course, this issue continues the ever-popular “Real Weddings” section, featuring a very talented newlywed: Elena Victoria. Find out about Elena’s local clothing line, how she designed and crafted her very own wedding gown, as well as her information so you can get the wedding gown of your dreams!